Well here we all were, happily studying for our Diploma in Child Welfare at Loughborough College between 1970 and 1972. Posted on March 18, 2009 March 18, 2009 Categories reminiscingTags 1970, 1972, diploma in child welfare, loughbrough college10 Comments on College Days!!! While driving home early on Sunday morning after a weekend away, I passed a red telephone box on the main street of my village. My first thought was that it probably does not get much use in this day and age – with land lines in most homes and a mobile phone in most pockets. But then my mind went winging back to my youth when a telephone box was a place where queues formed. My parents moved to their brand new council home in 1954 when I was 6 months old and a telephone line was definitely not on their list of priorities. I don’t remember being bothered by this, we communicated with family and friends by post or by simply visiting the ones who lived close enough. I had a pen pal in America for years and used to love receiving her long and fascinating letters. My best friend had a home telephone and as I grew up I began to see the value of this piece of equipment particularly when boys suddenly became interesting to speak to. My friend used to sit in the comfort of her well lit hall for hours chatting to her latest love but me? The nearest telephone box to my house was around a quarter of a mile away and I had to walk across a dark unmade track – formidably named ‘The Black Pad’ to get to it. The phone box stood at the end of Black Pad – its light shining dimly, the nearest streetlight being some thirty feet away. Behind it were the gates to the cemetery which was another dark eerie place. And this is where I had to go if I wanted to speak to the boy of the moment and, if he didn’t have a telephone at home we used to exchange telephone box numbers and run the risk of somebody else answering the call when they were just passing the box or worse still somebody using the box at the exact time that I was supposed to be calling. I have vivid memories of standing in the telephone box with the receiver to my ear pretending to be on a call but in reality holding down the receiver rest waiting for my boyfriend to call. While he was eight miles away queuing to get into his box I had my own queue forming outside. 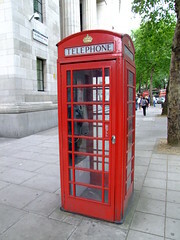 This went on for years, turning out in all weathers and conducting most of my relationships from a telephone box. When I was nineteen years old I went to work for the Post Office as a telephonist. Oh what joy, we had a kiosk inside the exchange and all calls were free. Queues still formed but we were warm and dry at least. I remember when the engineers wanted to test the ‘new’ international direct dialling system to the United States, they were looking for telephonists who knew somebody over there and were prepared to allow half an hour international calls on Boxing Day that year to prove that the system worked. That year was the very first time I had spoken to my American pen friend Bonnie and her family. It was an amazing experience, they had ‘phones in every room and were all talking at once, I couldn’t get a word in edgeways! Sadly I have lost touch with Bonnie since then – I wonder what she’s doing now? Maybe I can find her on the internet, and then maybe I can call her again for free on my Skype internet ‘phone as I have broadband at home. Or perhaps I could text her from my mobile once I have her mobile number or as a finale I could call her from my home telephone in the kitchen or from the bedroom extension. How my life has changed I still wonder if anyone uses that little red telephone box in my village? Posted on August 21, 2008 August 21, 2008 Categories reminiscingTags broadband, communication, internet, post office, skype, telephone, telephone box, telephonist3 Comments on Communication is the key!!!! Whilst sorting out some of my Mothers things after moving her into a nursing home I came across an old tape recorder complete with two spools of tape. My mind immediately lurched backwards to my fifties childhood when my Father had purchased this item to record our voices for posterity. Oh what fun, winter evenings were no longer boring as we gathered round the tiny microphone, singing songs, reciting poetry or in my Father’s case reading from our encyclopaedias or the bible. I vividly remember his rich Irish accent as he read and how, when he sang Irish folk songs with us children, his accent broadened with words from his homeland. When the rest of the family joined us for Christmas the tape recorder was brought out again and my Father would secretly tape the parties when my Mum’s five brothers brought their families over to our house. They were such noisy events and I remember some of the recordings were ruined by the shouting and laughing of children and adults alike as we played our Christmas games. On summer evenings we would hold the microphone to the open window and record the birdsong in our garden and sometimes when she had gotten up early, Mum would record the dawn chorus. We would sit very quietly listening to our favourite radio programmes, holding the microphone close to the gold mesh speaker on our large Bakelite radio. Programmes like ‘The Clitheroe Kid or ‘The Navy Lark’ were always punctuated with my brother’s and my stifled giggles in the background. Then, when I was older, there was ‘Pick of the Pops’ with Alan Freeman, I always managed to keep quiet whilst taping that, and afterwards my friends and I would dance around the house to our favourite songs. All these things would still be there on those spools of tape, I could only hope that the tape recorder would still be working. But first, the plug. At the end of the lead was a round pin plug; at least it had three pins although the flex had only two wires. Thankfully I wired the replacement plug correctly and switched the machine on. I then put one of the spools of tape on the machine and threaded the end of the tape to the empty spool on the other side. I cleaned the tape heads with a cotton bud, crossed my fingers and switched the machine to the ‘play’ position. I seemed to be waiting forever as the clear end tape ran through the machine followed by the brown recording tape, and all the time the machine just made a loud humming noise. I really thought the words on the tape were lost. Then suddenly, although the humming continued, I could hear my Dad singing! The tears sprang to my eyes as the years fell away and I was a child again, six years old and singing ‘Katy Daly’ with him, and later were the party games and the voices of my uncles, aunties and cousins, all young again, lovely carefree times. The birdsong and favourite radio programmes of that time, they were all there as I painstakingly went through the tapes – snatches of conversations between Dad and his brother Andy, when he visited from Ireland. My Mum chatting away and our Siamese cat, Simba, howling dramatically in the background. Voices of people long gone from my life, my father died when I was 19 years old. He was not there to give me away as I married and he never met my two wonderful children. All of my uncles except for one have died; even some of the cousins have left this world. I stood, an emotional 52 year old, listening to them all – it was like a miracle! A world away from today where all sound and movement is recorded in one place – onto a DVD! I will find a company who can get these voices onto a compact disc and bring the past to the present without the humming noise. Where my children can hear their Grandfather laugh, joke and sing together with his daughter, their mother. Hopefully some young entrepreneur has already designed the means to find the voices on these tapes and load them onto CD.